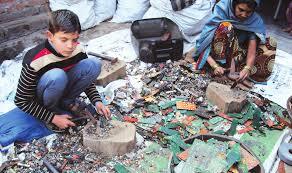 India's top corporate body, Associated Chambers of Commerce and Industry (ASSOCHAM), has admitted that there are about four to five lakh child workers in the age group 10-15 engaged in various electronic waste (e-waste) activities alone. It does not, however, say what percentage does it form of the total number of child workers in India. Suggesting that child labour is particularly alarming because “India is emerging as one of the world's major electronic waste generators and likely to generate 52 lakh metric tonnes (MT) per annum by 2020 from the current level 18 lakh metric tonnes”, the study says, e-waste in India is “growing at a compound annual growth rate (CAGR) of about 30%. “The sad part is that a mere 1.5% of India's total e-waste gets recycled due to poor infrastructure, legislation and framework which lead to a waste of diminishing natural resources, irreparable damage of environment and health of the people working in industry”, the study says. “About two-thirds of e-waste workers in India suffering from respiratory ailments like breathing difficulties, irritation, coughing, choking, tremors problems who all are engaged in various e-waste (electronic waste) activities due to improper safeguards and dismantling workshops”, the study says. “The recovery of metals like gold, platinum, copper and lead uses caustic soda and concentrated acids. The workers dip their hands in poisonous chemicals for long hours. They are also exposed to fumes of highly concentrated acid. Safety gear such as gloves, face masks and ventilation fans are virtually unheard of”, notes study.